Bake rolls as directed on bag. Meanwhile, in 4-quart saucepan, cook pasta as directed on package, adding asparagus, carrots and peas the last 6 minutes of cooking time. 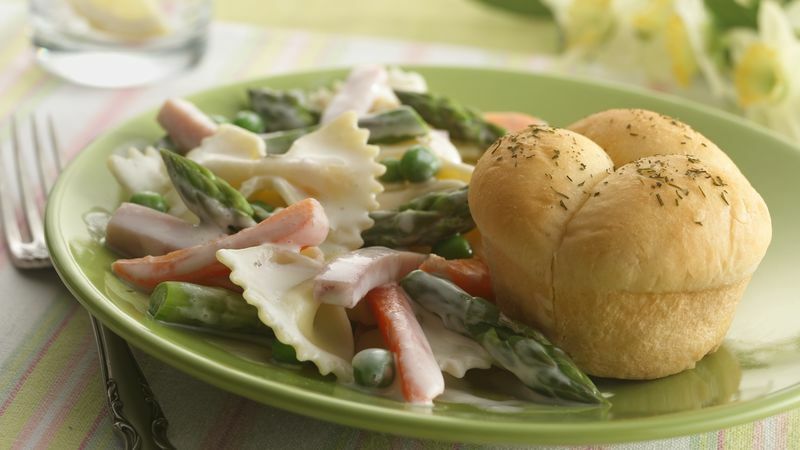 After adding vegetables, return to boiling; cook until pasta is tender and vegetables are crisp-tender. Drain; return to saucepan. Add ham and spreadable cheese to pasta mixture. Cook over low heat, stirring constantly, until cheese is melted and smooth. Remove rolls from oven. Brush with butter; sprinkle with dill weed. Serve warm with pasta mixture. You can use broccoli in place of the asparagus for a change of pace.